Open Road Audi is matching donations For every $1 you donate, they will match your dollar in full! With a funding pool of $12,000, Open Road Audihopes to donate it all; they just need your help to contribute and make each dollar count. We are proud to partner with Open Road Audi for this campaign. They have generously offered to match our follower's contributions to the campaign in a $1 = $1 sponsorship. Every contribution made has double the impact! With $12,000 set aside for matching, we get to help twice as many schools and their children during this holiday season! In Surrey's highways and byways they are known as the Wrap Around Team - 15 school liaison staff and their RCMP associates who help juveniles rated at extreme risk for homelessness, addiction, gang affiliation or sexual exploitation. The ultimate risk is death. But Jon Ross, a school district social worker, likes to contemplate the successes, which far outweigh the disasters. "Our philosophy in helping is that we are equal partners with parents. We can't pretend to be an expert on a particular young person. We have to honour the history and not judgmentally." The history for this story begins three years ago with a 14-year-old boy on the road to perdition. His mother was interviewed by The Vancouver Sun but because of the serious nature of the criminal charges he would face as a minor, she cannot be identified. This is her story: "My son was hanging out with all the wrong kids and smoking pot. He had impulse control issues and wasn't coping," she said. He ran away from home and came under the influence of an older male who supplied him with drugs and was involved in a series of armed robberies where replica firearms were used as well as bear mace. "He was 16 and in jail awaiting a bail hearing when I called Jon. I was panicking," she said. Her son was released and went into care as he was too scared to return home. "We had a meeting with Jon and John Wilson, the RCMP officer (embedded in the team) and the probation officer and drew up a plan for services he'd need going forward. "We were looking for drug counselling and for his schooling to continue because he'd ruined his reputation at school. At the time, we didn't know what the Wrap program was." When the team met the boy, they found he wanted to learn the guitar, so they arranged for lessons. "They were there making sure he didn't miss his court appearances or other appointments, driving him, checking with him every day because he has difficultyself-managing and he has 22 bail conditions. "He needed detox and rehab because he was using crystal meth, and Jon was involved in all that. He went to Peak House (for drug rehab) but was kicked out and put into a group home in Burnaby. Basically, all services were cut off because the Wrap program couldn't reach him there. "But Jon still kept in touch. My son got involved with some kids he didn't get along with and got stabbed four times. Nothing life threatening, thankfully for us, and I brought him home." That was two months ago. "Jon was able to put all the services back, get him back with a clinician (for his addiction and mental health issues), get him counselling, got him back into schooling, got him back with a social worker. "He's only at home now because of Jon's help. He's been a victim and a criminal all in one, and it's hard to sort that out as a parent, but Jon's provided me with counselling." So how is her son doing? "He's a lot better. He's managed to get himself out of those circles, and he's got a job he loves. Jon and John Wilson are probably the only people he trusts. "When he doesn't meet his bail conditions, they just don't stop working with him. "They say, 'What can we do to meet the conditions,' again and again and again. They help him over and over and I've never seen them quit. No matter how many times he's quit on himself - they never quit. "Without the help of Jon Ross and his team, l would have lost my son. "He probably would be dead." The Wrap Around Team has applied to The Vancouver Sun's Adopt-A-School program for $10,000 as an emergency fund to help families on their caseload, many of whom are impoverished. 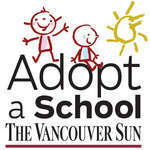 The Vancouver Sun’s seventh annual Adopt-A-School campaign is under way, and we are again asking readers to consider the plight of children who come to school unfed, improperly dressed and suffering the psychological effects of living in poverty. We are not talking about a few children. We are talking about thousands. They are found in every school district in this province, no exceptions. Last year the Vancouver Sun Children’s Fund, which administers Adopt-A-School (AAS), distributed $604,000 in emergency funds to 86 schools across the province to help alleviate the most two most common forms of suffering — hunger and lack of proper clothing. And while much of the money was spent in this way, there were also grants to help teachers heal some of the psychological damage to children whose lives are so blighted by poverty that they are arriving in school at their wit’s end. Money was spent on supplying and equipping sensory rooms where children can decompress and be soothed into a state where they can function and learn and on other therapeutic programs that teachers tell us they need. “Since AAS began in 2011 we have sent almost $4 million to teachers and principals struggling to deal with the effects of poverty, in almost all cases, without resources,” said Harold Munro, editor of the Vancouver Sun and The Province and chair of The Vancouver Sun Children’s Fund board. When a parent shows up at a school in tears with no food in the home and no money to buy any what are they supposed to do? It happens regularly in schools all across the province. “For teachers and principals it must be heartbreaking and this newspaper does not think it right that this burden should be borne by them alone,” Munro said. * Provided money for emergency food vouchers. * Supported programs that distribute food in order to get impoverished families through the weekend. * Bought beds to get children off the floor, or to replace those infested with bedbugs. * Provided money to a special unit that deals with the most vulnerable students in danger of being sexually exploited or tempted to join gangs for no other reason than not having enough money to buy a meal or a decent winter coat. It has got to the point that we are seeing not only concern from adults but from students. The last campaign showed that children in the Gulf Islands were bringing extra food to feed hungry friends who had none. In Langley three teenagers set up their own program to feed needy families over weekends. This campaign tell the story of how high school students in a Vancouver school have been moved to organize their own breakfast program after discovering that a quarter of the school’s students were without food at home at least once during a month. So the problem is obvious to school districts, principal, teachers and now other students. The Vancouver Sun has never said a critical word about any political party in relation to the AAS campaign, except to ask the government of the day to do something. We are repeating that request to this new government. In the meantime we are again asking our readers to support our campaign. Your generosity has carried us this far. You have fed thousands of children, helped hundreds of families. “We can’t do it without you,” Munro said.